Brilliant white LED lights now being used by ECC as replacements have resulted in some strong protests. “Brilliant whites” have also appeared at the top of York Hill (pictured) and adjacent to School Green by Forest Way. Councillor Chris Pond has complained to ECC about the harsh LED pressing for softer ones. A perhaps more in keeping “brilliant orange” is the replacement unit at the Kings Hill, Woodbury junction…bright but softer and perhaps the acceptable standard for future replacements? Motorway style? Residents at the top of picturesque Forest Way have taken “direct action” against against the “motorway” style lamp replacement (3) on the edge of the forest. Strong protests have been made to the County Council. Cllr Pond is claiming a “small victory” on this one which he says the council plans to “embellish” in the summer. At the junction of Queens Road and Pump Hill a heritage lamp which “disappeared” a couple of years ago leaving a dark junction has at last been replaced on the opposite side of the road, but by another distinctly “non-H” lamp put in place some weeks back, but now leaning perilously while residents press for a heritage replacement (just outside the conservation area). While in Stony Path, the “mysterious disappearance” of an expensive heritage lantern has been the subject of Council of a council inquiry into suspected “resident action”. There is now a “hopefully temporary non-H” “brilliant white” replacement lantern on top of a heritage post. Oh, and many of the “black” heritage posts are now a speckled rusty colour, badly in need of a coat of paint. 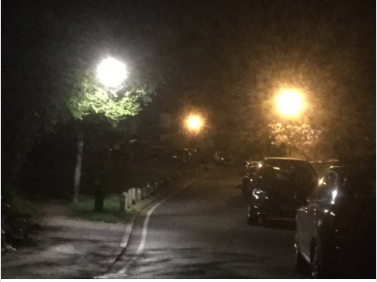 The issue of lighting has prompted lively discussion on HillsWatch, the Amenity Society Facebook page with some support for brighter lighting but general support for in-keeping lampposts and the softer LEDs – a position which the Hills Committee strongly supports.